One of the real joys of running a bridal boutique is getting to follow the wedding day adventures of brides after they’ve passed through Pilsley and found their dream dress. That’s why we’re starting up our very own Our Brides series to bring you wedding inspiration from Alexandra Anne brides. And I guess Valentine’s Day isn’t a bad time to start. And what a way to start! 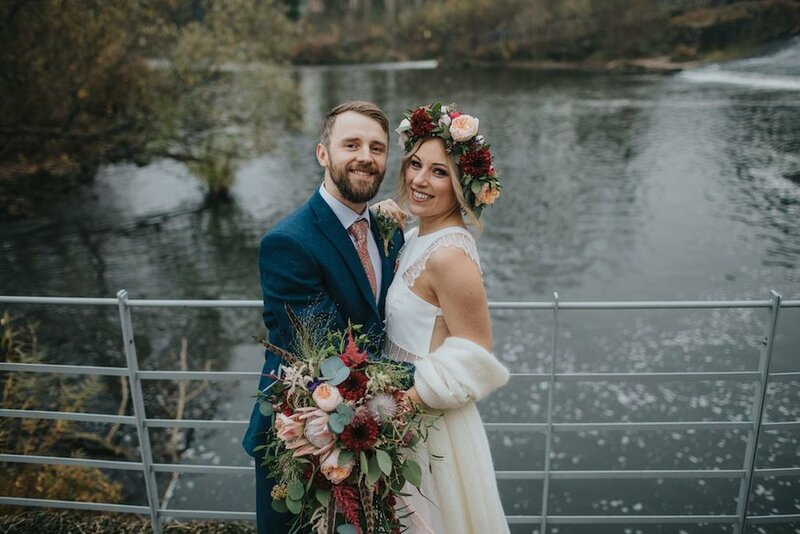 Lauren and hubby Sam turned their Derbyshire wedding into a woodland wonderland last autumn – with more than a hint of the unexpected. Smoke bombs! Donuts! A Daruma Doll (I had to look that one up)! Lauren looked amazing in her Rembo Styling Bjork dress, and I love the detail that went into creating this ethereal boho wedding day. How would you sum up the style of your wedding? A big wedding filled with all our family and friends, relaxed day / party at night, non-traditional, bohemian, greenery, textures (fur/velvet/wool), metallics, smoke bombs, dream-catchers, tambourines, dark, moody, autumnal flowers with pops of colour. Where and when did you tie the knot? At the West Mill in Darley Abbey, Derbyshire, on 23rd November 2018. And what was your wedding dress? We met in August 2006 at a college party. Sam came over as me and my friend were selecting party music. Sam said we were playing “cool tunes” and we got chatting, realising we knew some of the same people. Both our friendship groups had arranged to go to the same festival a few weeks later and decided to pull both groups and go together... I guess the rest is history! What about the proposal? When, where, how? Sam thought I had seen the ring so he hid it in the bed of our bell tent tipi. I then sat on the ring, and Sam had no other choice but to propose there and then! We had a fantastic day at Skellig, Michael enjoying our engagement without telling anyone at first to soak up the future ahead! How did you find the whole experience of searching for the right dress? I tried on about 80 dresses, and I loved it! I didn’t want the wedding dress experience to end... but the Rembo Styling Bjork dress caught my attention on Instagram. I fell in love with it and saw it as a sign that I needed to track it down. Alexandra Anne stocked the dress and as soon as I tried it on, it was like it was made for me! My Mum bought my dress along with a Rembo Styling shawl. Tell us more about your outfit on the day. How did you complete your look? As well as the Rembo Styling Bjork dress I found at Alexandra Anne, I wore a flower crown by Avant Garden and Bella Belle shoes, plus my Mum’s gold earrings and a gold crystal bracelet by Luna. Handmade velvet multi-way dresses by Valendize on Etsy. It’s difficult having a bridesmaid entourage and finding a dress to suit all. I originally set out to find a variety of different styles but then came across these luscious velvet dresses to go with our textured theme. What do you remember about the morning of the wedding? It was the perfect morning at The Pentahotel where I hired out one of their funky conference rooms to get ready in. My oldest friend of 28 years, Kim at The Hairworkz did an amazing job on my hair and the bridesmaids’ hair. We’ve been friends since we were 3 and she’s been doing my hair since I was 19, and of course she was always going to do my wedding hair. It was so perfect to have her part of the wedding morning! Kim you’re amazing! Avant Garden Weddings provided eucalyptus for the bridesmaids’ hair and a beautiful flower crown for me. Did you have a theme in mind when putting it all together? I wanted to create a modern bohemian theme. I had mini tambourines as favours and pheasant feathers (which everyone stuck in their hair) and guest nick-name place cards set for table settings. Table decor was a mixture of wooden cotton reels and logs with coloured gin and wine bottles I collected. I used tall charcoal candles to create a dark moody table along with eucalyptus and lavender. I gathered jars and filled them with moss and scented grey tea lights. Everyone complimented the smell of the room! As we were heading off on our worldwide travel expedition for 20 months the following week, we also incorporated a travel theme into our day. Table names were hexagon glass mirrors with white stickers of countries we’ve visited, a giant map and travel tag seating chart with a Pop the Question Quiz on each table for guests. Although we forgot to read out the answers after the speeches, ha! You can follow our travels on Instagram. Avant Garden Weddings by Laura who was super excited to make my floral vision a reality! I made collages, printed and laminated for her to keep. I envisaged pampas grass to create impressive centrepieces, a wild, draping boutique with pheasant feathers and ribbon and a flower crown with dark moody flowers and pops of colour. We also purchased a flower hanging garland and props for our photo booth, where our guests could use a Polaroid camera to create our guestbook! Some cracking pics in our leather photo album. Red Wine & Signs we called it! My maid of honour and I designed the entire signage for the wedding on a Saturday night with red wine (of course) and cheese! I envisaged a clean, modern look which popped with greenery that represented the earthy tones I was having in my flowers. My MOH is super creative and I could rely on her to help create with her keen eye. She arranged the entire printing with her supplier from work, saving me a huge job... and that’s just one of a million reasons why she was my MOH! Did you do anything unusual on the day? We incorporated a few non-traditional bits into our wedding day. My cousin (practically my brother) was my Man of Honour: there was no way I could not include him in the wedding party. For the ring box, I had a gold pentagon glass box filled with moss and both our wedding rings in. 11 years ago, the mother-of-the-groom bought me a pot pig money box for Christmas. I decided to decorate it with four of my bridesmaids all those years ago, writing notes which we slipped into the pot pig. I promised I would smash this pig on my wedding day and see what we all wrote! And so I did, with a hammer. Turned out there was only one note in there that said ‘Sillybilly’! We decided to go against the typical cake-cutting tradition. It’s just not us to stand there posing with a knife for a photo! Who even eats cake anyway? So we had an amazing donut wall with 100 donuts that my bridesmaid ordered. Instead of cutting a cake we had a Daruma Doll we’ve had for many years and which we hadn’t drawn eyes on, so we did this instead and shoved a donut in each other’s mouth! How did you feel when you were walking down the aisle? What are some of your favourite memories of your wedding day? We met through the love of music and it plays a huge part in our lives. Our friend of 12 years played Led Zeppelin’s Stairway to Heaven as the Bride Tribe walked down the aisle. It was truly magical. We always knew we wanted a band in the evening for our wedding because we love to party! We hired Minnie and the Moochers, a soul and funk band. The lead singer had a James Brown voice and really got the evening started! There were dance-offs happening all over the Spinning Room between friends and family like they’d known each other for years! We picked all our own music for the day and everyone complimented our choices throughout. What gave you the biggest laugh? When we throw a party we usually have a theme, so we threw a hat party in the evening asking everyone to bring a party hat. My bridesmaid (aka Rachael from Soul Sequins) made my stunning crystal party hat! You can find her on Instagram. If there was one piece of advice you could give to a new bride-to-be, what would it be? I know everyone says don’t sweat the little things or things that might not go to plan, but it’s so true. You don’t want to remember the bits you were stressed about on your day so let it go over your head and just forget about it. Make your wedding about everything you both love. You don’t have to follow any typical traditions if you don’t want to. Change it up, make it your own... go with what your gut says and don’t feel like you have to involve everyone (it gets messy) or justify why you want things the way you want them... just go with it! Newer PostWedding Dress Shopping – What are my Options?